If you have ever made bread by entirely hand you will appreciate that it can be a messy, fiddly job. The ability of half mixed dough to stick to skin and get under fingernails is amazing and cleaning it off takes some time. A stand mixer can make the kneading process much easier and cleaner but leaves you with the problem of finding the right temperature to make sure the dough rises correctly. Sometimes it can seem like making bread by hand is too much trouble – until you can smell the bread baking and then finally get to eat it. A much easier option, by far, is to use a fully automatic bread baking appliance. By using a bread maker like the Panasonic SD-YD250, all that you need to do is add the ingredients and liquid, press a button and come back later to a perfectly cooked, freshly baked loaf of bread. You end up with a homemade loaf of bread, all that you have done is cut out all the laborious mixing, waiting for the dough to proof and shaping of the loaves. 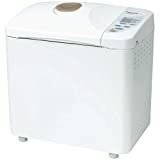 With the Panasonic SD-YD250 (see today's price) you can also program the bread maker. Just add the ingredients and set the timer and your bread will be cooked up to 13 hours later. This means that you can get up in the morning to the smell and taste of freshly made bread, or come home to the same. The Panasonic SD-YD250 also allows you to make several different types of bread, choosing whether you want a light, medium or dark crust on it. You aren’t just restricted to making loaves of bread either. The Panasonic SD-YD250 can be programmed to just make the dough allowing you to make shaped breads, rolls or pizza crusts. Considering the size of loaves it can make (up to extra-large sized loaves) the Panasonic SD-YD250 is not a particularly large bread maker. It measures 13 3/8 inches x 9 inches x 14 inches and it weighs 15 lbs. It will bake 3 different sized loaves, medium, large and extra-large which weigh approximately 1 ½ lbs., 2 lbs. and 2 ½ lbs. There is also choices of bread type that can be baked; basic white bread, whole wheat, multigrain, French bread and pizza. Along with the bread type there are different baking options; standard bake, rapid bake, added raisins and sandwich bread. There are also three dough options for when you want to shape the dough yourself. The bread of your choice can be cooked straight away or the timer set to delay the start by up to 13 hours. Whichever you choose, as soon as the bread is fully baked the Panasonic SD-YD250 will switch over to a keep warm setting for one hour. Not only does this mean that your bread will still be hot when you are ready to eat it but, when bread cools down in a bread maker, condensation can occur which is detrimental to the condition of the finished loaf. One feature on the Panasonic SD-YD250 that contributes to the quality of the bread that it produces is the automatic yeast dispenser, or as Panasonic prefer to call it the YeastProTM system. The yeast is loaded in to a separate dispenser in the lid of the bread maker. At the optimum time in the mixing, the yeast is added. This results in a better quality, lighter loaf. There is a secondary advantage when the timer is used because the yeast is not left for extended periods in the mixing bowl where it may come in contact with the liquid being used. It is an unfortunate fact that mass produced bread stays fresher longer that home baked or artisanal bread. The fact that the Panasonic SD-YD250 can make 3 different sized loaves means that you only need to make the amount of bread that you will eat within a short period of time. That way you can always have fresh bread without any waste. The length of time it takes to bake a loaf in the Panasonic SD-YD250 varies depending on which program is selected. The fastest setting, or rapid bake option, take just under 2 hours to complete whereas the French bread setting can take up to 6 hours. Typically a loaf will take 4 to 5 hours from start to finish. If the raisin setting is selected the machine will sound an alert and pause for 3 minutes during the kneading to allow for the addition of raisins, dried fruit or nuts. If you have had a bread maker in the past, one simple feature on the Panasonic SD-YD250 will be appreciated. It comes with a handle on the bread tin to make for easy lifting out from the bread maker. The handle will still be hot though and oven gloves or similar will be needed. The Panasonic SD-YD250 is the #1 bestselling bread maker on Amazon. It is competitively priced and full of features that make baking a wide variety of breads easy. The instruction manual is clear and explains in a logical sequence how to use each option. The Panasonic SD-YD250 offers a wide variety of different types of bread all of which it will complete with no input from you apart from adding the ingredients. It comes with pre-set programs to cook basic white bread, whole wheat bread, raisin, or French bread. The Panasonic SD-YD250 can cook a loaf of bread on the rapid bake function in under 2 hours or if you want your bread later, you can delay the start of the process by up to 13 hours. It can bake the bread from start to finish, just make dough for hand finishing for rolls, or pizza crusts, or it can just bake pre-made dough. Each bread type come with a choice of either a light, a medium or a dark crust.